High manganese lightweight steel alloys in the Fe–Mn–Al–C system are promising alternatives to quenched and tempered Cr and Mo steels for transportation and military applications. The understanding of nonmetallic inclusion formation and their effect on the mechanical properties is of extreme importance for further alloy development. Sharp and brittle AlN forms prior to the liquidus and has been shown to decrease notch toughness. 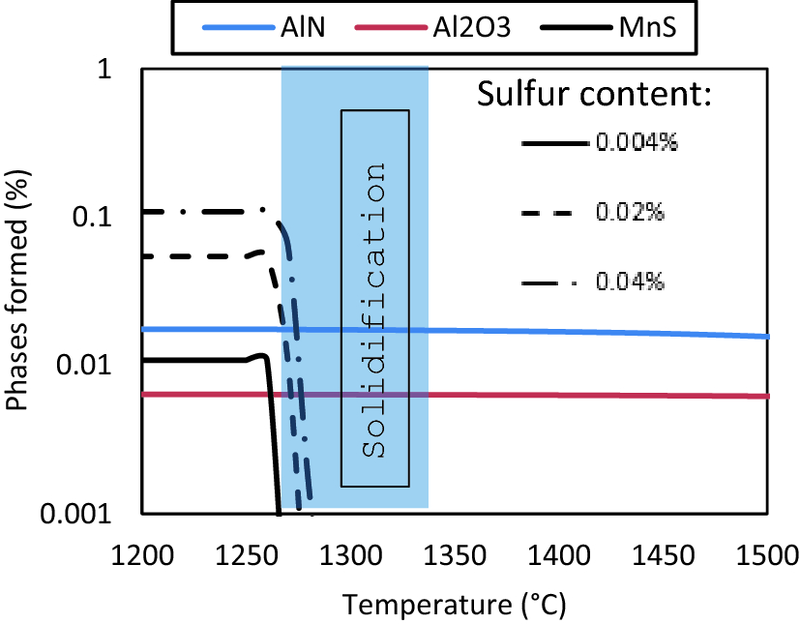 Controlled additions of sulfur may promote soft and globular MnS that precipitates around AlN during solidification, thus mitigating their detrimental effect. The effect of controlled sulfur additions from 0.004 to 0.042%S was studied in a Fe–30%Mn–9%Al–1%Si–(0.9–1.2)%C–0.5%Mo steel. The main inclusions observed were AlN, MnS, and AlN-cored MnS. Charpy impact toughness was evaluated in the solution treated condition and in specimens aged to 329–340 HBN. Toughness is a function of the overall inclusion population. In aged specimens, same was true only for steels with 0.9% carbon; above 1%C the toughness was below 15 J for any sulfur content. A few studies have tried to model how Charpy V-Notch breaking energy (CVN) and dynamic fracture toughness (DFT) vary according to inclusion population and types in these alloys. Schulte et al.12 compared the CVN of steels with a nominal composition of Fe–30%Mn–9%Al–0.9%C–1%Si under different deoxidation practices and observed no relation with total nonmetallic inclusion average diameter nor total inclusion density. However, at − 40 °C, the CVN decreased from 38 J to below 20 J when AlN density increased from 4 to 50 particles/mm2. The same was observed at room temperature for a steel with nominal composition of Fe–30%Mn–9%Al–(0.9–1.6)%C–0.9%Si. Different explanations for the morphology and formation mechanism for MnS inclusions have been proposed by different authors. Herring20 attributes the deoxidation method as the primary factor responsible for sulfide morphology. In silicon semi-killed steels, Type I sulfide inclusions are predominant. As the active oxygen content is reduced with more effective deoxidation such as in aluminum-killed and Ti deoxidized melts, the sulfide morphology transitions into Type II and III morphologies. In a study by Oikawa et al.21 of high sulfur steels (%S > 1), they observed the sulfide morphology transitioning from Type I to II then to III by increasing Si and Al to up to 5%, in steels with nominal composition Fe–2.5%Mn–1%S–(2–5)%Al–(2–5)%Si. These high Al and Si levels could be considered as overkilling the steel. 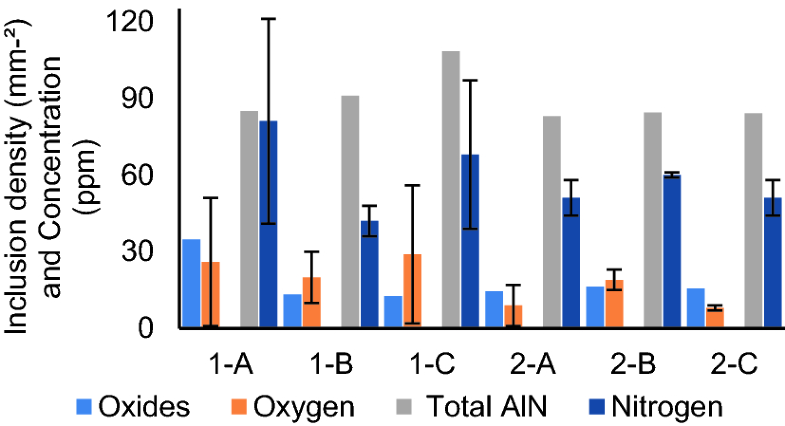 In fact, Marich and Player22 proposed that low dissolved oxygen (< 10 ppm) is the sole reason for Type III formation. Similarly, Liu et al.10 studied sulfide formation in Fe–Mn–Si–Al TWIP steels with low total oxygen (5 ppm) and observed Type III manganese sulfides when the inclusions were not modified by Ca, and Type I when modified. Bigelow and Flemings23 extensive research on sulfide inclusions has data indicating that for sulfur levels up to 0.2%, both carbon and silicon lead to the formation of Type III inclusions. For even higher sulfur content, the morphology changes to a faceted dendritic structure. 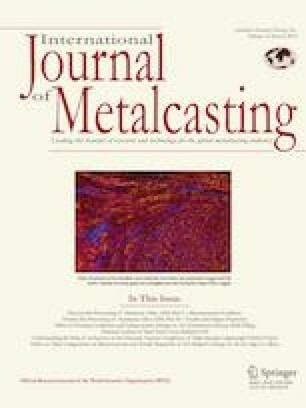 In this context, the current study evaluates the effect of different sulfur additions on the types of nonmetallic inclusions formed and the corresponding influence on the microstructure and fracture properties of Fe–Mn–Al–C alloys. At the same time, at the different sulfur contents, it will study the MnS morphology in these steels. Two similar heats were prepared in a 100 lb induction furnace with a nominal chemistry of Fe–30%Mn–9%Al–1%Si–(0.9–1.2)%C–0.5%Mo–X%S. Molten metal was kept under argon cover by flowing 50 scfm of argon on top of the furnace. The crucible inside the furnace was MgO-based. The furnace was initially charged with high-purity induction iron, graphite, ferrosilicon, and ferromolybdenum. After the initial charge was melted, the remaining induction iron, 1020 aluminum, and electrolytic manganese were added and allowed to fully melt. Calcium wire treatment was accomplished by plunging 15 in. of a 25% calcium cored wire into the melt. In the second heat only, argon stirring was done after Ca-treatment using an argon lance with the flow of 15 scfm with the intent to float inclusions created during refining treatments. Floating slag was then physically removed and the melt was heated up to 1640 °C and tapped to a MgO ladle. Each steel was bottom-poured into no-bake modified Y-block sand molds with the casting geometry shown in Figure 1. A base heat was poured directly after being tapped into the ladle. Consecutive sulfur additions were made by plunging steel bags containing iron pyrite into the melt before the second and before the third pour to modify sulfur content. The second heat was produced because primary results from first heat showed that optimal sulfur content was likely in-between two of the sulfur addition from first heat. Schematic of the modified Y-block casting showing two orthogonal views. The regions marked in red show the location of inclusion analysis and chemistry samples. Units are in centimeters. The modified Y-block castings were sectioned using a water-cooled abrasive saw to produce chemistry and mechanical test specimens. Samples for chemistry and optical analysis were taken from the region marked in red in Figure 1. The tensile properties used in calculation were taken from a steel with similar composition of Fe–29.3%Mn–8.76%Al–1.22%C–0.99%Si and hardness of 250 HBN after solution treated.31 Dynamic fracture toughness tests were conducted utilizing a Tinius Olson Charpy model 84 impact machine fitted with an MPM instrumented striker at room temperature. In the above equations, B is the thickness, b0 is the unbroken ligament or (W − a0), W is the width, a0 is the total crack length, obtained as the sum of notch length and pre-crack length, σY is the effective yield strength, S is the span, σYS is the yield strength, σTS is the ultimate tensile strength. Inclusion analysis was performed using an automated scanning electron microscope (SEM) ASPEX PICA 1020 equipped with back scattered electron detector (BSED), energy dispersive spectroscopy (EDS) detector, and Automated Feature Analysis software. The Automated Feature Analysis (AFA), software allows for automatic identification and quantification of compositional and morphological information in large areas comparatively to manual measurements. The software controls a highly automated stage to scan a determined area in the sample and identify inclusions by z-contrast from a BSE image. The software calculates the average diameter of an inclusion by utilizing an 8-chord averaging method. Compositional data is provided by EDS analysis. Scans were performed at 500 × magnification with a search grid step size of 0.16 µm, at 20 kV and 40 µA. More details on the methodology can be found on the study done by Harris et al.34 The samples were taken from the original casting shown in Figure 1 and from just underneath the fracture surface of the broken test bars. Results for both regions were very similar and final results were reported as the average of both. For each steel at least three surface scans were conducted, for a total area 15–30 mm2. Inclusions were classified in nine different groups: AlN, AlN–MnO, AlN–MnS, MnS, Ca complex inclusions, Mn–Al–S–O, Ti complex inclusions, and porosity. The chemistry analyses were done by optical emission arc spectroscopy (OES) in a Foundry-Master arc spectrometer from Oxford Instruments. Standards of comparable Mn and Al contents were used for calibration. The oxygen/nitrogen and carbon/sulfur contents were measured by combustion methods using a LECO O–N analyzer and LECO C–S analyzer, respectively. Samples for inclusion analysis and optical microscopy were prepared utilizing standard metallographic techniques. For acquiring optical microscopy images, 10% Nital was used as etchant. Analysis of the fracture surfaces of broken specimens was conducted utilizing a HITACHI S4700 and FEI HELIOS Nanolab 600 SEM. The chemistry results for each steel are shown in Table 1. All chemistry values in this study are expressed in weight percent. The lower limit of phosphorus quantification in the OES used is 0.005%, thus, a precise quantification of phosphorus was not possible. However, it can be considered a low phosphorus steel with less than 0.005%P. The presence of ferrite and a phase consistent with κ-carbide was observed in the ferrite-austenite interface of as-cast steels, as shown in Figure 2. The amount of ferrite was quantified from optical images using ImageJ software as less than 5% of the total area coverage. After solution treatment, heat 1 presented a persistent phase on austenite grain boundaries consistent with κ-carbide. In contrast, heat 2 only presented small particles widely dispersed along austenite grain boundaries, as shown in Figure 3. This difference has impacts on the mechanical properties of those steels. As it will be shown later the persistent κ-carbide present on grain boundaries of steels from heat 1 decreases the toughness. Aged microstructures presented no optical difference from the solution treated condition, other than the already expected higher concentration of κ-carbide identified by a faster and more intense etching. The microstructures of steels in the as-cast condition. (a) Steel 1-C showed a small fraction of ferrite inside an austenitic matrix and intense κ-carbide precipitation on austenite grain boundaries. (b) Steel 2-C, showed a larger fraction of primary ferrite (less than 5%) at the center of austenite dendrites with κ-carbide precipitated on austenite–ferrite interface. Etched with 10% Nital. Representative micrographs from steels (a) 1-B and (b) 2-C in the solution treated condition. (a) A phase consistent with a κ-carbide or an intermetallic phase was present on some austenite grain boundaries, of steels from heat 1. (b) For heat 2, less occurrence of this phase was observed with only some isolated particles on grain boundaries. The larger dark-contrasted phases also denoted in these images are nonmetallic inclusions that were etched away. Etched with Nital. Inclusion population of the steels. Heat 2 was less efficient on coating AlN with MnS. “Others” are oxides or unclassified inclusions. Results are an average of 3–4 analysis with at least 1000 inclusions each. On the steels without sulfur addition, 1-A and 2-A, inclusions containing AlN are about 80% of the inclusions. On steel 2-C with 0.020%S, this number is close to 60% and in 1-C with 0.042% it is 40%, the balance is mostly MnS when sulfur is added. The inclusion density of 1-A with no sulfur added is less than half the density present after addition of 0.042%S. This indicates an exaggerated addition of sulfur in this steel since the objective was to coat the AlN with MnS without a large increase in the inclusion population. As the sulfur content increases, the only inclusion type that increases in quantity is MnS, either as a singular inclusion or as AlN–MnS cored inclusions. The ternary diagrams in Figure 5 show the main three elements in the chemical composition of the nonmetallic inclusions, both diagrams contain over 95% of the nonmetallic inclusions recorded in the steel. The ternary shows that initially 1-A contained mostly AlN, with Mn readings from the matrix underneath it. After sulfur increased from 0.004% in 1-A to 0.042% in 1-C, a large number of inclusions with 15–35 wt% of sulfur and Al as high as 50% appeared. Figure 6 shows examples of MnS, AlN–MnS, and AlN inclusions with respective chemistries. Both AlN and MnS presented an angular morphology. The Type III faceted MnS was formed in all steels independent of sulfur content. The only Type I MnS seen had significant amount of Ca in its composition. Composition of ternary diagram containing the inclusions which the major three elements are the ones in each diagram. Increasing the sulfur in 1-A from 0.004 to 0.042% in 2-C, only increased general size and the amount of high Mn and S inclusions. In both cases, the diagram has over 95% of the total amount of inclusions recorded area scanned. Examples of SEM-BSE images of the main types of nonmetallic inclusions present in the steels and corresponding nominal chemistries, MnS (a), AlN–MnS (b), and AlN (c). The inclusions classified as “others” were mainly particles that recorded sulfur and nitrogen too low to be classified as either AlN or MnS, and those were not more than 5% for any scan. Some Mg-based inclusions were observed and are believed to be from reaction with the MgO crucible or the argon lance used. Titanium-bearing inclusions often contained nitrogen and carbon and were shown agglomerated with MnS inclusions. The amount of “others” was higher in the first mold poured in each heat due to a higher presence of calcium modified sulfides, which tend to float and be poured first in lip-poured ladles. The total inclusion density was the lowest of 70 mm−2 for the lowest sulfur content seen in steels 1-A. Addition of sulfur to 0.02% in 1-B and 2-C raised it to 180 and 159 mm−2, respectively. The difference in inclusion density although not small is within the standard deviation of the values. The highest inclusion density of 291 mm−2 was for the highest sulfur content of 0.042% in 1-C. The inclusion density of single AlN inclusions decreases with increasing sulfur additions. In heat 1-A (0.004%S), the amount of single AlN is the highest with 47 mm−2. In heat 2, even for similar sulfur of 0.005 and 0.007% in 2-A and 2-B, respectively, the amount of AlN is much smaller, below 30 mm−2, this is due to more AlN being coated by MnS as shown by the amount of AlN–MnS next to 50 mm−2 in 2-A while less than 10 mm−2 in 1-A. In steel 2-C with 0.02% S, the amount of single AlN is less than 10 mm−2. In steels 1-B also with ~ 0.02% S and 1-C with 0.042%, the amount of AlN was less than 1 mm−2. It is then clear that the addition of sulfur is leading to the formation of MnS in the surface of free AlN. As expected, most of the AlN is coated with MnS with higher sulfur additions (> 0.02%). Addition of sulfur in general slightly increased the sizes of all inclusions; the average diameter of the inclusions of each steel is shown in Figure 7. Average size increased from 2.3 µm in 1-A and 2-A to 2.6 and 2.8 in 1-C and 2-C, respectively. Increase in inclusion size was mainly the result of an increase in size of MnS and AlN–MnS. However, the average increase in all cases was no more than 1.1 µm when comparing any two steels. The total inclusion area fraction follows the same trend with the sulfur additions. Average inclusion diameter for cast steels. All inclusions tend to increase in size with increasing sulfur addition as well as time held in the ladle. Hardness was measured in the as-cast, solution treated, and aged bars; results are listed in Table 2. The higher carbon content in steels from heat 1 increased the matrix hardness compared to heat 2. Heat 1 had an average hardness of 343 HBN and 256 HBN, in as-cast and in solution treated conditions, respectively. An 86 and 39 HBN increase when compared to heat 2. Charpy V-Notch (CVN) toughness’ are listed in Table 2. In the solution treated condition, the highest breaking energy was measured for the steels with less sulfur 1-A and 2-A, with values of 179 J and 152 J. After aging, breaking energy decreased significantly for both heats, for steels 1-A, 1-B, and 1-C, breaking energy was around 10 J despite the differences in sulfur. For heat 2, toughness decreased to values between 30 and 45 J with lower results for higher sulfur additions. The highest dynamic fracture toughness (DFT) in the solution treated condition was 670 kJ/m2 for steel 1-A. At 0.019%S, the DFT of solution treated bars of steel 1-B decreased to 422 kJ/m2. However, for further sulfur increase in steel 1-C the solution treated DFT was 508 kJ/m2, slightly higher. After aging specimens from heat 1 to a hardness of 329–336 HBN, the time to fracture during the impact was too small and not enough data for toughness calculation was recorded by the instrumented striker. When aged to 333 HBN, steel 2-A had a DFT of 137 kJ/m2 and after increase in sulfur from 0.005% in 2-A to 0.02% in 2-C the DFT decreased to 43 kJ/m2 at 340 HBN. The fracture behavior during the dynamic fracture toughness testing was Type IV in solution treated condition for all steels, characterized by stable crack growth followed by ductile tearing.5,9 As mentioned before, the time to fracture after aging was too short for calculating the DFT in steels from heat 1, therefore, a Type I fracture with a sharp load peak followed by unstable crack was recorded. On steel from heat 2, the fracture behavior was a Type II/I fracture at 0.005%S and Type I only at 0.007% and 0.020%S. The manganese sulfides formed were in general faceted Type III inclusions despite different sulfur contents. The Type III morphology of the manganese sulfides is in agreement with studies by Oikawa et al.18 that suggests this type is formed in overkilled steels. The sulfides morphology is also supported by previous studies proposing low dissolved oxygen (< 10 ppm) leads to Type III formation.10,22 Even though the dissolved oxygen was not measured, total oxygen content was below 30 ppm in all steels, and as low as 8 ppm in 2-C, it implicates that dissolved oxygen is even lower since oxides, even in small amounts were present in all steels, as in Figure 4. The nitrogen contents are between 42 and 81 ppm; however, standard deviation is as high as 40 ppm and no definitive difference can be determined. The total AlN density, obtained as the sum of the densities of AlN, AlN–MnO and AlN–MnS, is very stable throughout the steels with its minimum as 83 in 1-A and 108 mm−2 in 2-C. The same is true for oxygen and respective oxides, values are shown in Figure 8. In Figure 7, the sizes of AlN were similar to AlN–MnS within each steel, while single MnS was generally smaller. This indicates that smaller AlN is preferentially coated with MnS. Also the size of all inclusions increases with sulfur addition. However, this may not be solely attributed to sulfur additions since steels with higher sulfur were also held in the ladle for longer time possibly leading to clustering and growth of preexisting AlN and other inclusions. The inclusion density of nitrides (as any form of AlN) and oxides presented a good relation with the measured total oxygen and nitrogen. Inclusions that attach to each other can form a continuous inclusion cluster during solidification. This will cause the average diameter to go up but number of inclusions to go down, since it is counted as a single inclusion. However, the close-spaced inclusions can be quantified and were recorded as a density of clusters per area. Clusters were identified as groups of two or more inclusions spaced by less than twice the diameter of the larger one. Figure 9 shows a clear linear relation between sulfur content and the number of clusters per area for both heats. Number of clusters per area had a strong linear relation with sulfur content for both heats. Figure 10 shows the breaking energy results for each steel in the solution treated and age hardened condition. The sulfur additions affected the CVN breaking energy in different ways depending on the heat treatment condition and amount and type of inclusion formed. Previous studies on Fe–Mn–Al–C showed an inverse relationship to the amount of AlN inclusions and the breaking energy.9,11 This trend was not observed by the steels tested in this study. Charpy V-Notch breaking energy in the solution treated and in the age hardened conditions. Increasing sulfur content (in parenthesis) decreased the breaking energy, except for age hardened steel from heat 1. The addition of sulfur modified the AlN inclusions by coprecipitation of MnS on it. With the addition of 0.019% sulfur, the coprecipitation of MnS on the surface of AlN decreased the amount of single AlN inclusions to virtually zero on steel 1-B. Thermodynamic simulation using software ThermoCalc 2017a with database TCFE9 was done to predict the amount of nonmetallic inclusions to be formed upon solidification. Simulations were done to a steel with composition similar to the ones cast, shown in Figure 11. To form the inclusions, it was considered 30 ppm of oxygen, 60 ppm of nitrogen, and the sulfur was varied according to 1-A, B, and C. It was predicted that AlN inclusions nucleate at high temperature while at 0.004%S the MnS only nucleates from the solid. At that chemistry 0.017%wt of AlN is expected to form. For inclusions with an average radius, R, to be coated by a thickness of R/2 of sulfur, the amount of sulfur formed needs to be 1.25 times more. At 0.004%S, the amount of MnS formed is half the amount of AlN, while at 0.02%S it is formed 3 times more. Since not all MnS nucleates on AlN and the thickness of the layer is variable, 0.02% appears to be a good addition for the nitrogen levels on these steels. Thermodynamic simulation in equilibrium condition of the amount of nonmetallic inclusions formed upon solidification of a Fe-30Mn-9Al-1C-1Si-0.5Mo steel with 30 ppm of oxygen, 60 ppm of nitrogen and the sulfur from 0.004 to 0.04%. However, in the solution treated condition, the highest breaking energy for each trial was obtained from base chemistry steels without sulfur additions (1-A and 2-A) with values of 179 and 145 J, respectively. In the aged condition, in both heats, addition of sulfur decreased the breaking energy at the same time it decreased the single AlN inclusions, the effect was stronger in heat 1. It appears then that the coating of AlN by MnS did not improve the toughness. It was actually the steels with less sulfur that presented the higher CVN toughness. It is important to notice that coprecipitation of MnS on the surface of AlN increases the average diameter of the inclusions leading to a detrimental effect on impact properties. From 2-B to 2-C, however, the amount of single AlN decreased from 30 to 10 mm−2, while MnS increased only from 35 to 55 mm−2. In this case, the breaking energy did not decrease as sulfur increased from 0.007 to 0.02%, for both heat treatment conditions tested. This is an indication that the beneficial effect of AlN coating by MnS on the breaking energy is being masked by the effect of increased inclusion density, area fraction, and size. 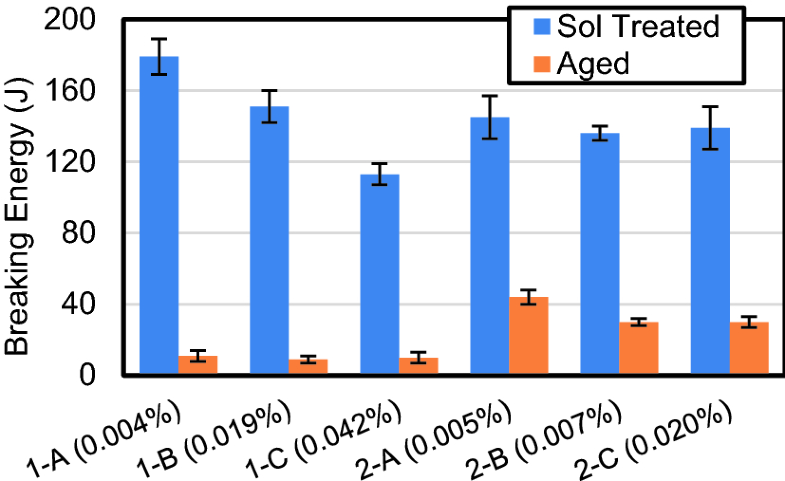 Figure 12 shows the relation between the CVN breaking energy and total inclusion area fraction, in the solution treated and aged conditions. The inclusion area fraction is directly associated with the sulfur addition, in both conditions. In other words, the highest inclusion area fractions are for the highest sulfur addition. As it can be seen, there is an inverse linear relation between breaking energy and inclusion area fraction. The highest breaking energies were in solution treated condition for steels 1-A and 2-A, with 0.004% and 0.005%S, respectively. The breaking energy of 179 J decreases by 66 J when sulfur increased to 0.045% in 1-C. This corresponds to a decrease in breaking energy of 40 J for an increase in inclusion area fraction of 1000 ppm. The relationship between Charpy V-Notch breaking energy and area fraction of nonmetallic inclusions in the solution treated and in aged conditions. 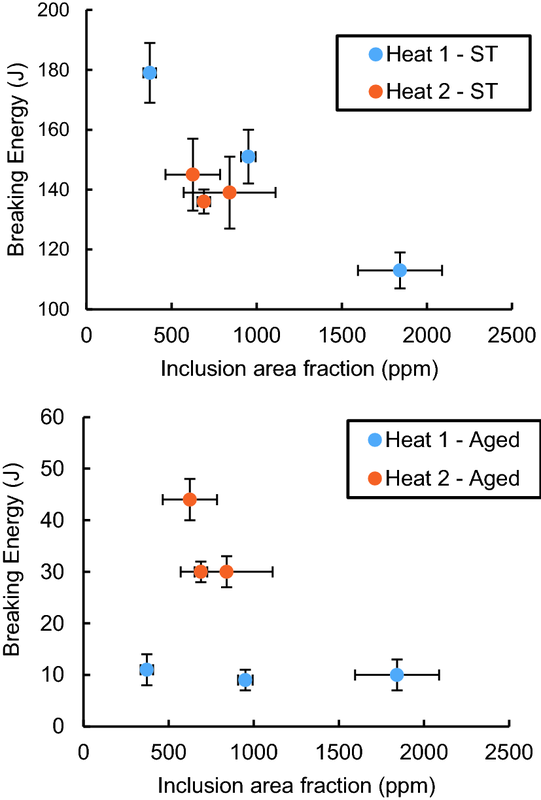 There is an inverse relationship between inclusion area fraction and breaking energy, except for the aged steels with 1.15%C from Heat 1. 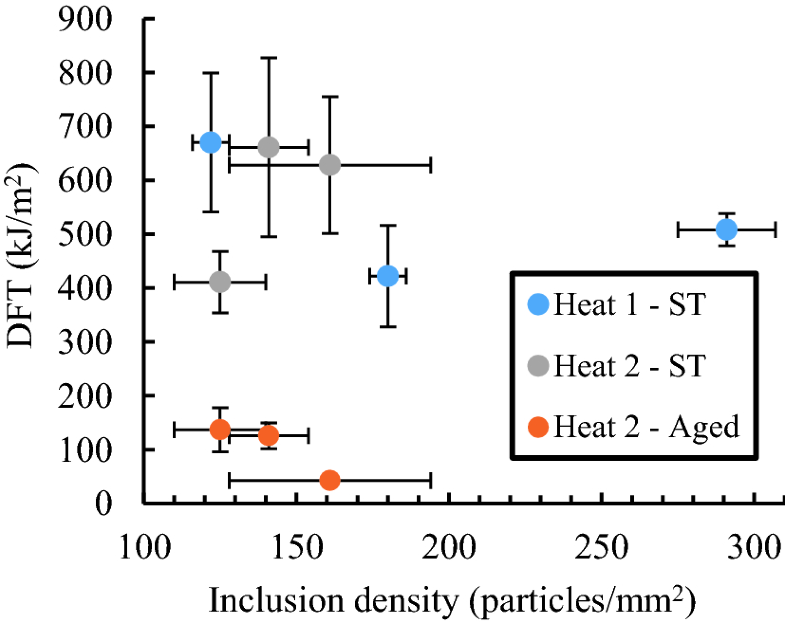 Inclusion area fraction increases by 1470 ppm from 1-A to 1-C while it only increases by 216 ppm from 2-A to 2-C. Because of it, the effect of the nonmetallic inclusion area fraction in the breaking energy is much more evident in steels from heat 1. The fracture surfaces in Figure 13a, b for steels 1-A and 1-C in the solution treated condition shows how the increased inclusion population modifies the fracture decreasing the absorbed energy. On 1-A voids nucleate on the matrix or on the few inclusions present, while in 1-C it nucleates on large and close-spaced inclusions clusters leading to faster void coalescence and final rupture. Secondary electron images of fracture surfaces of Charpy bars after impact test. In the solution treated condition, (a) steel 1-A with 0.004%S had a ductile fracture, few inclusions were seen inside the voids. With increased sulfur to 0.044% (b) steel 1-C maintained the ductile fracture but voids nucleated on larger inclusions that were more numerous. After aging at 530 °C to a hardness of 320–340 HBN, (c) steels from heat 1 had a low energy intergranular fracture and (d) steels from heat 2 had a mixed ductile-intergranular fracture. On the age hardened bars, a decrease in the CVN breaking energy with increasing inclusion area fraction and sulfur content is observed only for heat 2. This suggests that fracture in the aged condition is not controlled by the overall inclusion density. For test bars from heat 2, aged to a hardness of 333–340 HBN, the breaking energy decreases by approximately 14 J, from 2-A to 2-C, with an increase of 216 ppm in inclusion area fraction. The carbon content of heat 1 is nominally 1.15%C, and this decreases the breaking energy in aged specimens to such a low level that it is not related to inclusion population anymore. As described in the literature, above 1%C the precipitation of κ-carbides occur in the grain boundaries.31 Also for Fe–30%Mn–9%Al–(0.4–1.2)%C, solution treated at 1150 °C and aged at 550 °C for 16 h, literature shows that above 0.75%C the steel KCU continuously decrease by over 100 J/cm2 when at a value of 1.2%C.35 The low fracture energy on steels from heat 1, indifferent to the inclusion population, is also represented by the fracture type shown in Figure 13c, a completely intergranular fracture, without any void nucleation. Steels with a lower carbon content in heat 2 presented a partially ductile fracture even after age hardening, as in Figure 13d. This indicates that, with increased age hardening, fracture is affected less by the inclusion population and depends mainly on κ-carbide precipitation on both grain boundaries and in the austenite matrix. The inclusion spacing was measured as the average space between each inclusion center and its nearest neighbor center and is referred to as the nearest neighbor distance (NND). 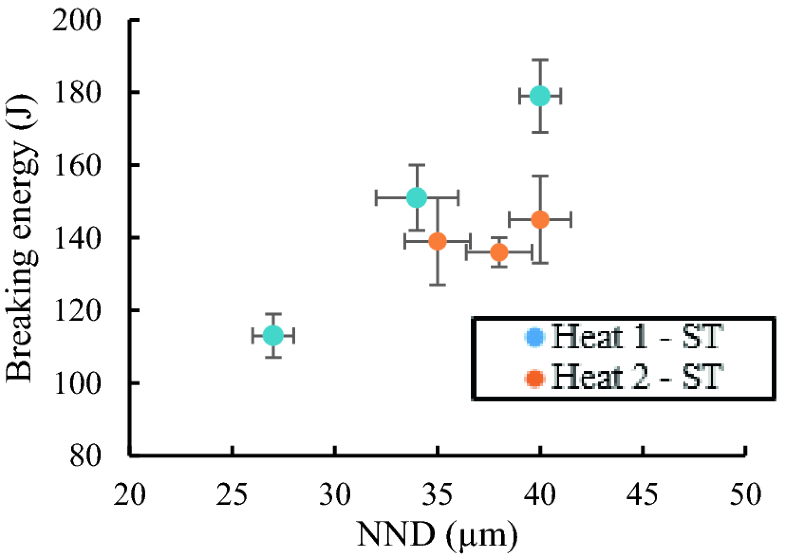 The CVN impact test results had a linear relation with the NND for solution treated steels, for NND from 27 to 40 µm the breaking energy increases from 113 to 179 J, in Figure 14. Similar trend was observed in another study for the DFT of Fe–30%Al–(3–9)%Al–0.95C also solution treated at 1050 °C for 2 h.9 However, in the present study it only occurred for the CVN impact test. The CVN breaking energy shows a linear relationship with the NND in the solution treated condition. The DFT results did not correlate to the inclusion population as well as the Charpy V-Notch impact toughness. The result for steel 2-A in solution treated condition was significantly lower than 2-B and 2-C, which could indicate a beneficial effect of the MnS; however, steel 1-A was significantly tougher than 1-B and 1-C. Although, as shown in Figure 15, when comparing same nominal composition steels and different sulfur content there is an overall decrease in DFT with increasing inclusion density. After aging, heat 2 presented a direct but not strong relation between these properties. The relation is sustained by the fracture type as determined by the load–displacement curves, which change from Type II to Type I after sulfur addition. The intense decrease in breaking energy observed for increasing carbon over 1% was also confirmed in the DFT tests. Heat 1 with 1.2%C had fracture with such a low energy that data recorded was insufficient for the DFT calculation. An overall decrease in DFT with increasing inclusion density is observed. In a previous investigation, for compositions in the range Fe–30%Mn–(3–9)%Al–(0.9–1.6)%C–0.9%Si, the fracture behavior was Type IV in all the solution treated bars regardless of the aluminum or carbon contents. With aging, the fracture behavior gradually changes to Type III and II, and finally Type I.9 These changes occurred for increasing hardening times or carbon contents. Previous studies observed a correlation between DFT in solution treated condition and inclusion density.5,9 Both studies also showed that other factors like deoxidation practice and carbon and aluminum content have even stronger influence on it. The effect of deoxidation on the DFT fracture reported is an evidence that the type of inclusion formed is an important factor on its influence on the DFT. The inclusion analysis in Figure 4 and DFT results in Figure 15 shows no evidence of any improvement in DFT properties by coating of AlN inclusion by MnS. The DFT testing was also shown to have large variability of results on the alloy and conditions tested even following the specifications determined by ASTM E1820. AlN is a brittle and angular inclusion that has been previously reported to greatly reduce impact toughness of high manganese and aluminum steels. 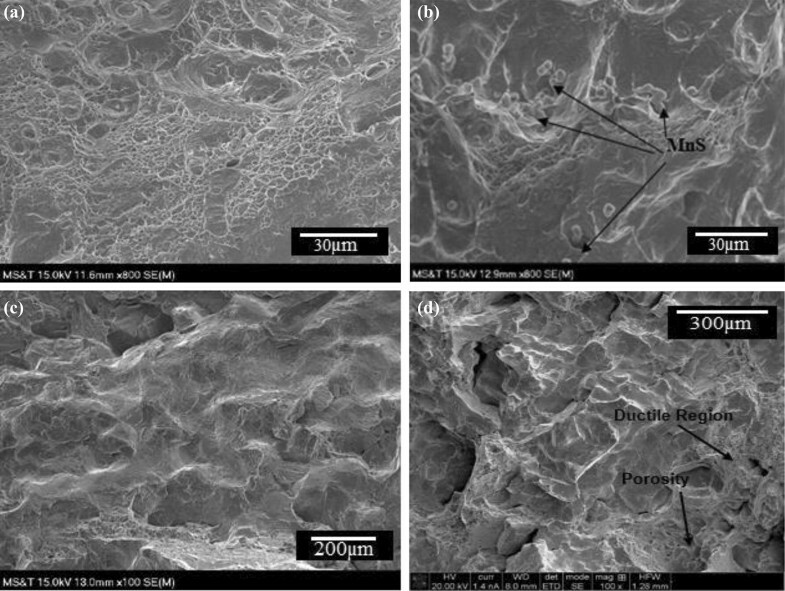 In this study, sulfur additions were used to modify AlN inclusions in a Fe–30Mn–9Al–1Si–(0.9–1.2%)C–0.5%Mo steel. Sulfur additions of 0.02%S in comparison with 0.007%S decreased unmodified AlN from 30 to 10 mm−2 and in the solution treated condition, slightly improved the breaking energy, despite an increased area fraction and average size of inclusions. However, results showed that sulfur additions generally decreased toughness and produced a large amount of coarse and clustered Type III MnS. It was shown that the CVN breaking energy of solution treated specimens decreased by approximately 40 J for every 1000 ppm increase on inclusion area fraction, close to 20% decrease. In the conditions tested, minimizing sulfur and consequently MnS inclusions optimized the CVN breaking energy. Increasing amount of carbon in solid solution from 0.9% to about 1.1%C increased the solution treated toughness from 159 to 179 J for steels with the lowest sulfur contents. After age hardening at 530 °C to a hardness in the 310–340 HBN range, it was shown that breaking energy was mainly a function of carbon content. Increasing carbon greatly increased the age hardening kinetics and resulted in κ-carbide precipitation on grain boundaries. This produced brittle intergranular fracture and impact toughness values as low as 10 J on steels with about 1.1%C. Dynamic fracture toughness generally decreased with an increase in the amount of inclusions. No clear relation can be drawn from the results due to fairly large standard deviation on the results despite being done according to ASTM E1820. This work was supported in part by a grant from the Association for Iron and Steel Technology, AIST, Foundation as part of the Kent D. Peaslee Junior Faculty Award. The authors are very grateful to AIST for this award. The authors also gratefully acknowledge Dr. Simon Lekakh for helpful discussion and all graduate students from MS&E Department at Missouri University of Science and Technology for assistance in conducting experiments.